Every company depends on sales for growth. When you start adding people to your team that will sell your services or products, you must learn how to lead salespeople. Sales are critical, and it could be the most important hires you make in the company. Also, it can take months for someone to get up to speed and start selling. This can be very expensive. 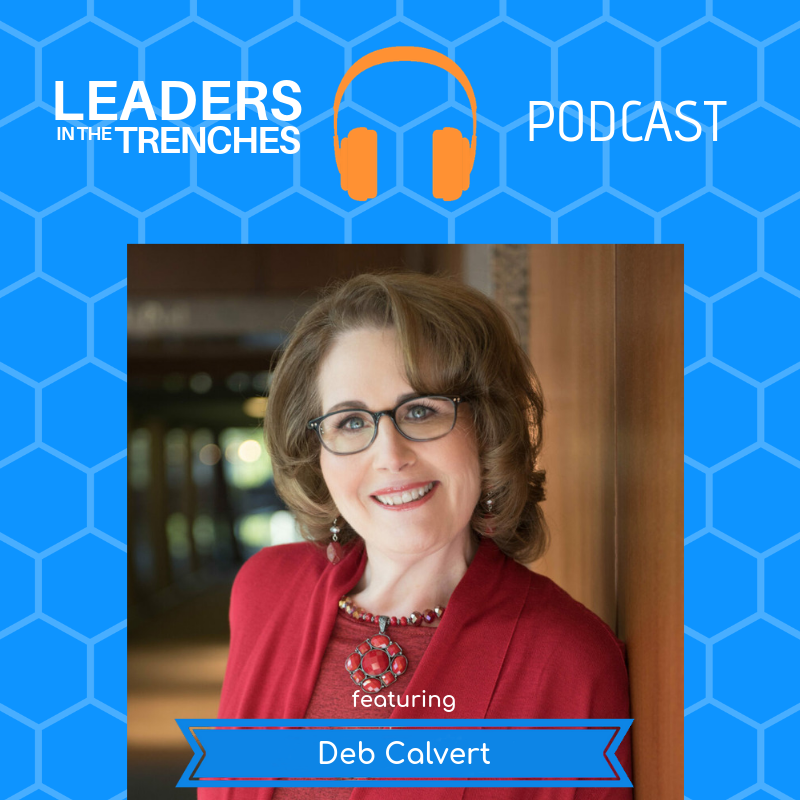 Today I am talking with Deb Calvert about how to lead salespeople. Deb is an expert in an area of leadership. Enjoy today’s interview where you will learn how to lead salespeople. Target Audience: Deb is a President of People First Productivity Solutions building an organizational Strength by Putting the People First. She focuses on the people’s parts of businesses, including coaching for Executives, Managers & Sales Teams. Hi, this is Gene Hammett. I am coming to you from leaders in the trenches, my questions to you today is how do you lead salespeople? If you are on the front lines trying to activate them to go out there and close more deals then you’re probably always already thinking to yourself, how do I lead them in this new economy and in this new world, how do I engage? them you know is it just paying them more commissions because that might not be working. I hear this all the time from leaders so I went into some experts that are really looking at this from a different perspective and I found Deb Calvert. Gene: Hi, Deb how are you? Deb: I’m good. It’s wonderful to be here with you Gene, appreciate the opportunity. Gene: it is great to have you here. I’m just excited to be able to talk to you about leadership and talk about sales and about you know kind of this where they fit together Before we jump into a Deb tell our audience a little bit about you and who you serve. Deb: Well, my company is people first productivity solutions and we build organizational strength by putting people first. We do that through executive coaching through team effectiveness and through working with salespeople directly. So all the places where you see leaders in the trenches we like to get right in there with them and help them to do a better job. Gene: Well, I guess you relate to the name of the podcasts. Gene: some people think it’s a bad thing and I think I just see it as being on the front lines and I heard a story years and years and years ago about what the CEO Home Depot and he said one of his favorite things to do was to put on his own orange vest, and get out on the front lines and I thought that’s what I want to talk about. I won’t talk about people who are doing that. Deb: yeah. You know, the title reminds me of the definition of leadership from Jim Kouzes and Barry Posner their definition is the art of mobilizing others to want to struggle for shared aspirations all right that want to struggle in the mobilizing and being in the trenches you can certainly be more effective and having that kind of impact when you’re right there with people. Gene: Well, I’m gonna tie on to that because one of the things I say from the stage and I say in my work is leadership is not about getting people to do the work. It’s about getting them to want to do the work. Gene: So, Deb, when you’re putting people first what, are some of the key aspects of getting people to want to do the work? Deb: Well, you nailed it a couple of shows ago you talked about employee engagement. And employee engagement really is the emotional commitment people have to feel it’s the emotional commitment that’s what causes them to apply additional discretionary effort so to want to work to want to be a part of something bigger that inspires people and it’s up to leaders to choose the behaviors that let people see how they can be enlisted in that vision. So, they can feel that sense of belonging, so it’s more than just punching the clock and making the widgets today. Deb: You help them to see why. It’s got to be the way of the work, and I don’t mean just because you’re going to keep your job just because you’re going to get the paycheck rational commitments not what we’re after here. But emotional commitment have you thought about telling people the mission and the vision of your company and do you have a purpose and a vision? I hope so. Like why does your company exist and what do you aspire to be and do in the world and then everything cascades from there. So I want you to do the work Gene, then I say, Gene, I need you to do X because that’s how we’re going to fill in the blank whatever the mission or the vision is we have to inspire people to want to struggle for something bigger than the work of today that’s just not exciting. Gene: I want to share with you my mission because you brought this up and we’re in similar world so, you know we could work with the same clients in different ways, but I want to go ahead and share it with you and just have a conversation on that. How does that sound? Gene: So I’ve been working on it, and this is not my kind of it is crazy big, but I see a world where everyone loves Mondays. Deb: Because visions are aspirational they might not ever come to be entirely true but every single step toward that vision is a positive there’s no downside of moving toward everybody loving Monday’s. Gene: Which is what all leaders want to hear. So, I want to give you a chance to talk a little bit about the new book that’s out as we’re recording this it’s pretty fresh right it will actually publish in July so but tell us about the book. Deb: The book is called stop selling and start leading, and it’s based on research with buyers and stories from sellers, and it’s also founded in 30 plus years of research from the five practices of exemplary leadership that’s Jim Kouzes and Barry Posner my co-authors and we took all of this research because we had a theory a hypothesis that if sellers frontline salespeople, if they would choose more frequently the behaviors of leaders so put away the old sales stereotypical behaviors and instead step into leadership with your buyers we thought if that happened it might make a difference for buyers and sellers and it does. It’s huge, so the whole book is about as a seller how can you step into your role leading buyers and guide them to a better place. Gene: So, now that we talked about the book and you know if you guys want to get a copy of the book it would be something that would help you and your teams but Deb, I want to have just a personalized conversation with you for a moment around how do leaders get their salesmen, salespeople, women to be the leaders inside that sale fro what does it take in that leadership role to for all that to come together? Deb: Well, I think it probably goes without saying but actions speak louder than words. So, how are you going to model the way forward are you going to truly be a leader and demonstrate leadership behaviors let’s start with the most basic one of all which is the DWYSYWD right? “Do What You Say You Will Do.” because your credibility as a leader is wrapped up in that and if you want people to act as leader salespeople or anyone if you want them to act as leaders then and be that example be that role model for them and don’t risk your credibility by not doing what you say you will do. Credibility is the cornerstone of leadership, so just that one simple thing can make a difference. Gene: Well, and that’s a really good point because there’s a lot of sales leadership, so that’s maybe they’ve gone through it they don’t have to to be on the front lines with these employees in anywhere and said they don’t have to model it, but you’re saying this is exactly the reason why you should based on where we’re going now and putting people first. Deb: You wanted to give people a sense of belonging. You want them to be engaged in the work and to have that emotional commitment and that passion even on a Monday then you’re gonna have to demonstrate that you have that, and you’re going to have to connect with them enough that they know that this is a place where they do feel a sense of belonging and where they’re valued they’re in noble that what they do and who they are is worthy and important all of that comes directly from the leader. Gene: Deb, what are some of the things that get in the way of great leadership in the sales world? Deb: One of the things that gets in the way of great leadership is great management and what I mean by that is let’s say your sales manager there are two parts to that job the first part is selling and maybe you focus a lot on that anyway so then your job is blurred the second part is managing that’s the numbers, and it’s the quotas and it’s the getting today’s work done today but it doesn’t say anything about the leadership the inspiring of people for example so it’s a good idea to manage sales and to lead people those aren’t necessarily the same thing they’re not mutually exclusive you can absolutely do both but you have to be intentional about it don’t let the day-to-day the reactive the here and now get in the way of your leadership. Gene: That’s a really good point about you know managing sales and leading people does that remind you of any kind of stories inside of the work that you’re doing that you can share with us? Deb: Yes? We could look straight down my client list it reminds me of a lot of stories okay here’s something and this is beyond just sales managers it’s true for a lot of people as they ascend in an organization the more functional capability you have and the more you’ve been rewarded for your brilliance your strategic ideas and the things that you do for the company and certainly as an owner-operator of a company it’s easy to fall into the trap of myths that say things like it’s lonely at the top or to think that leadership is somehow a solo act and so a story that goes hand-in-hand with that is I’m working with someone who has really had a skyrocketing career they’ve leapfrogged over a couple of positions and they now find themselves in the number-two seat this is a guy who’s only 43 years old and it’s a fairly good-sized organization and along the way he has been a doer he’s just he’s proven himself over and over and over again he’s really smart but he’s never really had to develop the interpersonal skills it’s been his functional expertise and his knowledge that’s gotten him where he is, and he’s struggling, he’s struggling now to mend relationships that he accidentally inadvertently impaired along the way and he’s struggling to get those those connections to really have the connections with people that would cause them to trust him to the ends of the earth that would cause them to know that he has their back that it’s not just about him his fast ascension made it seem like everything he was doing was self-serving it wasn’t it but it looks that way because people haven’t seen anything else. Gene: Yeah! In the moment of this interview to give you a message because we’ve been working on something with our clients and it really is pretty exciting I want to share with you about the culture scorecard specifically it’s called the transformational culture scorecard this will give you insight into where you are right now in eight different areas of your business we’re going to go from mission down through sales and marketing to leadership and people and systems there’s eight total areas that we’re going to go through this we’re looking at them across your business, and you can find out where you score on this so if you want to find out more about that specific to you just go to www.genehammett.com/culture and you can get the transformational culture scorecard all right now back to the interview. Gene: Well, I appreciate you sharing that story with us and I write all the time about a specific thing and it becomes you know I feel like do I really need to write about this again and your company being company people first who else better to talk about this but there are so many leaders that are going to put the numbers ahead of the people in an organization. I know you see this and what do you what’s one of the first things that you ask that leader about them putting numbers before people? Deb: Yeah. Well, if you don’t mind, I’ll back up and give you a little context here. Deb: I chose my company name in my philosophy very deliberately. I came from the fortune 500 a corporate background the company was going through a long, drawn-out sale and it was a company where people were highly valued until this happened, and the company was for sale, and suddenly it was all about profit, and it was all about products and it was all about programs and as was as if people were an afterthought and it really did feel that way so I set out to help companies rehabilitate themselves if they were losing sight of the fact that every single thing you want including profit it’s only going to come if you have taken care of your people that doesn’t mean in a patriarchal way it means making sure that people feel good about the work that they’re doing and that they’re engaged and invested so when I go into a company and begin to work with people. I just ask them you know what’s the cost? What’s the value of people leaving here as often as they do? What’s the cost of the amount of people that are in HR complaining about the way that they’re treated. What’s the value of people not being entirely engaged and only sometimes sort of lackadaisical and not fully there and in the work that they’re doing and when they think about that and there’s research to back it all up but I want them to have the first answer. When they think about it pretty soon they can see that maybe there would be some merit to doing things differently. Gene: Well, I want to go a little bit deeper with that because I in all of my episodes I have a practical and actionable so if that is the question. What’s the cost of lack of engagement and you know complaining in HR and all the other things that we hear? How do you help clients see the cost of those things? like is there some kind of exercise you walk them through that can help them see it for themselves? Deb: There is. I let me see if I can explain it reasonably well here without any slides because it’s a bit involved. Deb: Peter Drucker was doing this 50, 60 years ago so this is something that people can get to it’s a simple productivity formula so whatever they tell me, when they finally decide what is the cost and we’re able to talk about whether it’s the retention rate and the hiring or whether it’s the lack of productivity because that stems from engagement – when we find what it is then I go out and I give them the research because there’s data for just about anything related to employee engagement. Give them the data we run some numbers we use even the formula that Drecker did if it’s appropriate to productivity and we can come up with with a cost. There are things like here I’ll give you some shortcuts simple ones. things like the best leaders elicit three times the amount of talent and commitment from their employees versus leaders who have less engaged employees. So to be a good leader equals, employee engagement equals, three times the effort of people? Well, you tell me take anyone job if somebody on the assembly line was applying three times the effort and your output increased what does that mean in terms of numbers? right. So, there are complex ways but there are also pretty simple ways that you can come at this. Gene: Well, I appreciate that little exercise because if anybody’s looking at this they hope they’ll be able to take that in and start looking at the cost of these things inside their organization. So, if our audience wanted to get in touch with you Deb what’s the best place to point them to? Deb: Go ahead and email me [email protected] because I really do enjoy conversations and follow-ups and I’d be happy to talk with you more about these subjects it’s people first spelled out PS stands for productivity solutions you can find me online under the same handle people first PS and where ever we engage I’m looking forward to that. Gene: We’ll put all those links inside the show notes here on the show. thanks for being here and sharing your wisdom. Deb: Thank You, Gene, you’re doing great work here and boy leaders don’t get nearly enough support so I know that you’re very much appreciated. I am Gene Hammett, I’m your host today hopefully this kind of content is inspiring you to be an even greater leader than you already are and really have more intention and insight around being a transformational leader inside your company so if you’re enjoying this content make sure you reach out to tell me. Hi, if you have not downloaded the latest work that we’re doing on culture make sure you go to www.genehammett.com/culture and it’ll take you right into the transformational culture scorecard where you can map yourself see where you stand and you said your culture and your leadership. Alright! if you have any questions make sure you reach out and as always lead with courage and stay tuned next time. Today we talked about how to lead salespeople. To grow your sales and shift your leadership you have to evolve as a leader. I recently did an episode on changing your sales process. Check out this episode on how to lead salespeople.